If you have a type HK Mercury Spillage Kit which has expired or is close to expiry (see date label on the back of the kit), and the kit has been used, then you can extend its shelf life for a further 3-4 years by buying this REPLEN-USED pack. This is a lower cost option than replacing the entire spillage kit. 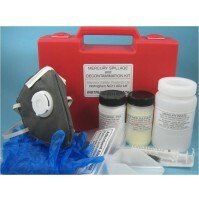 All of the components in the type HK Mercury Spillage Kit are inert and therefore have an indefinite shelf life, apart from the absorbent chemicals and the dust mask. The REPLEN-USED pack therefore contains one bottle each of microfine sulphur and calcium hydroxide, a new waste container, brush, scoop, syringe, dust mask, and a new expiry label. The old chemicals can be disposed of in their original containers as clinical waste or industrial waste for incineration. As with the new chemical packs, keep out of reach of children. The mask and other items can be disposed of in general waste.